Description: Branched spinescent shrub to c. 2 m high, dioecious or monoecious. Leaves alternate, frequently clustered, spathulate to linear, to 5 cm long, usually to 5 mm wide, sparsely covered with collapsed vesicular hairs. 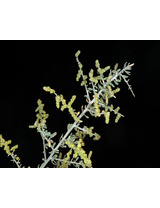 Inflorescence terminal, paniculate, to 30 cm long though usually much less, spiny. Flowers unisexual or bisexual, 1.5–2 mm diam. Perianth segments 5, fused in the lower half. Male flowers with 5 stamens and a rudimentary gynoecium c. 1 mm long; occasionally producing seed. Female flowers with minute staminodes or none; ovary pubescent; stigmas 2. Seed horizontal to vertical, c. 1 mm diam., reddish-brown to black.